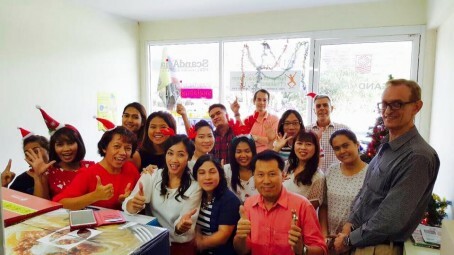 Scand-Media staff celebrates year end with a profit | Scand-Media Corp., Ltd.
Scand-Media Group celebrated the year end with a party on 25 December 2015 sending thankful thought to the suppliers of the group. Gifts from the suppliers were shared among all staff by simple lucky draw, but before each gift was handed over, the name of the sponsoring supplier was mentioned. After the lucky draw, Gregers Moller, Scand-Media Group’s founder and CEO, served his traditional Danish style “julegrød” – rice porridge boiled on milk – which most staff find disgusting. They must, however, all eat their portion to the last spoonful in order to find the almond hidden in the porridge! This year, the porridge was served as Ris-a-la-Mande, which is a much sweeter version of the dish with whipped cream and cherry jam. Much appreciated. And this year, there were two almonds hidden, so the excitement was higher. The gifts were two gold chains – again presents from suppliers to the group. The day ended with a dinner for all at a nearby karaoke restaurant to the delight of the neighbors. As part of the year end celebrations, the annual bonus was also announced. The bonuses are based on monthly wages and ranged from half a month to 2 months extra wages. Scand-Media also has a profit sharing tradition, whereby 20 percent of the net profit of each company is given in equal portions to each member of the staff regardless of position in the company. This year, the total amount of shared profit exceeded 600.000 Baht – evidence that despite the difficult times in the Thai economy, the company remained profitable in 2015. This entry was posted in News and tagged in profit sharing scheme.